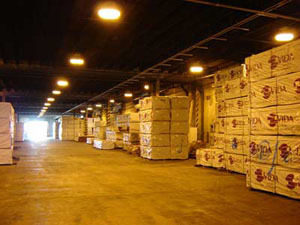 European Spruce Lumber Logistic Services ::: Vida Wood U.S.
Vida Wood U.S. provides complete logistic support from our European suppliers to our North American customers. Vessels: Our international vessels continually bring the finest European production across the Atlantic. 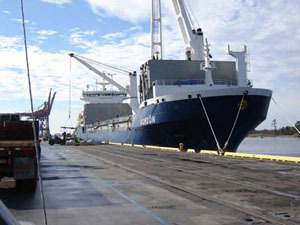 Loading in the ports of Europe, sailing on the water, and unloading in the port of Wilmington, NC, in the Eastern United States, our stock is replenished every three to six weeks. 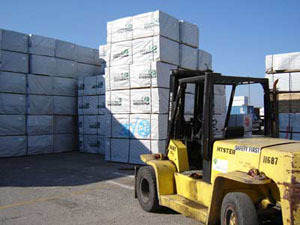 Storage: Dimension products are organized and stored on our lumber yards at each port for quick and easy loading access. Boards are stored in our enclosed shelters for added protection from the elements with similar ease of access. Delivery: We provide flexible and dependable options for the delivery of your orders. With a delivered price, our logistics department can load and ship your orders to their destination on time. Our trucks are booked to arrive during the "week of" the due date. Rush orders can be shipped with urgency depending upon the availability of product and drivers. Have your own trucks? We can price and load your orders for customer pick-up FOB at the ports. For large quantities shipping over long distances, we can load CSX 73' center beam rail cars for delivery to your reloads across the country. Handling: Do you need a different pack size? Or, a certain barcode label for a particular customer? No problem! We can provide repackaging and/or rebarcoding of units before shipment with minimal additional cost. Ask your dedicated account manager for more details. Call us today at 919-934-9904. Or, email us at kenny.woodard@vida.se.